FILE - Burkina Faso security force personnel stand next to the body of a suspected jihadist in Ouagadougou, May 22, 2018, after a pre-dawn raid by security forces on a house in the capital of Burkina Faso. The United Nations warned Tuesday that "an unprecedented humanitarian emergency" is developing in Burkina Faso, which has seen a surge in terrorist attacks and intercommunal violence. "Thousands of families continue to flee due to persistent insecurity," said U.N. deputy humanitarian chief Ursula Mueller, who just wrapped up a four-day visit to the West African country. "Burkina Faso authorities and humanitarian actors have quickly provided assistance. However, more has to be done to meet growing needs of the affected people wherever they may be," she said. "I urge all actors to respect the neutrality of aid workers and do their utmost to ensure the protection of communities." 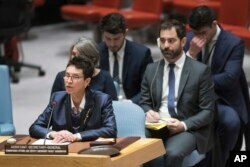 FILE - Assistant Secretary-General for Humanitarian Affairs and Deputy Emergency Relief Coordinator Ursula Mueller speaks during a Security Council meeting at United Nations headquarters, April 25, 2018. In February, the government and humanitarian community launched an appeal for $100 million to assist some 900,000 of the most affected people. On Monday, the United Nations announced it would give $4 million from its Central Emergency Response Fund to the relief effort. Burkina Faso has been rocked by increasing insurgent violence, predominantly in the country's north and east. There have also been terrorist attacks in the capital, Ouagadougou. The country of 17 million is also facing severe economic troubles, with 40 percent of the population living under the poverty line. The U.N. estimates some 670,000 people are at risk of food insecurity, while 130,000 children are in danger of severe acute malnutrition this year. The instability has displaced more than 100,000 people — over half of them just in the first two months of 2019. In December, President Roch Marc Christian Kabore declared a six-month state of emergency in 14 of the country's 45 provinces. 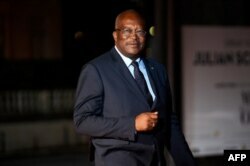 FILE - Burkina Faso's President Roch Marc Christian Kabore arrives at the Musee d'Orsay in Paris, Nov. 10, 2018. Last month, the United States raised its travel advisory for Burkina Faso to its next-to-highest level, advising its citizens to reconsider travel to the country due to "crime and terrorism." In its advisory, the U.S. State Department warned, "Terrorist groups continue plotting attacks and kidnappings in Burkina Faso and may conduct attacks anywhere with no warning."